112 pages | 3 B/W Illus. Former police and military personnel possess attractive skill sets for the private security industry;however, the transition to the corporate arena is not without challenges. Competition for these jobs is fierce. Many candidates possess degrees in security management—some having spent their entire professional careers in private security. 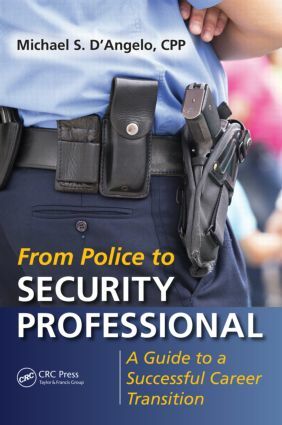 From Police to Security Professional: A Guide to a Successful Career Transition provides tips on overcoming the inherent obstacles law enforcement professionals face in making the switch and supplies a practical roadmap for entry into the private security world. Vital to your ability to succeed is understanding that security management has evolved into a distinct profession in its own right—one that brings with it different education, experience, and skill sets that clearly differentiate it from law enforcement. This book will help you better understand and be prepared for the policies, processes, and a corporate environment that operates in a very different way than the police structure to which you are accustomed. With the author’s help, you’ll give yourself every advantage to get the job and succeed in your new career. "While the book is valuable to persons thinking of transitioning into the security world, for a person who has actually made the successful switch from law enforcement to security professional, it is a great reminder of how that path can meander." "…worthy of academic standing in any university or college curriculum of study. The book flawlessly weaves together the journey of retirement and a conceptual understanding as to what it takes to make that transition successfully. From Police to Security Professional: A Guide to a Successful Career Transition provides a compelling template that is both empowering and a life manual for that journey." Michael D’Angelo is the corporate security manager for Baptist Health South Florida, Miami. Before beginning his security management career, D’Angelo retired as a captain from the City of South Miami, Florida, Police Department after 20 years of service. During his police career, he served in a variety of specialized units and gained significant managerial experience as a supervisor, middle manager, and senior commanding officer. He is a member of the International Association of Healthcare Security and Safety as well as ASIS International (American Society for Industrial Security), where he serves as a member of the Healthcare Security Council helping to propose guidelines and best practices for the industry.